squire: Welcome to this week’s discussion of the “Journey in the Dark” chapter of the Extended DVD Edition of Peter Jackson’s film, The Fellowship of the Ring. In the previous scene, the Fellowship has discovered the entrance to the hidden dwarf-city of Moria, but despite Gimli’s assurances of a warm welcome from his cousin Balin, the entry is littered with corpses of dwarves and goblins. Boromir says “It’s a tomb”. But the attack of the Watcher in the Water traps them inside, with the doors destroyed behind them, and as Gandalf says in the opening shot, "We now have but one choice. We must face the long dark of Moria." They must pass through under the mountains, to get to the gate on the far side. I have broken the chapter roughly into sub-scenes, with one post per day for discussion. squire: Here is a shot-by-shot breakdown of this chapter, with the accompanying commentaries by the Directing, Design, and Production teams tied to the shots. (I decided not to add the Actors’ commentary, because it primarily consists of Christopher Lee’s drug fantasies.) I am going to try to emphasize as much as possible a discussion of the film as a film, with minimal references to the book text. FarFromHome: Wow! Now I understand why you've been a bit scarce in the RR recently, squire! I'll try a few of your questions. Aerin: Oh My! Just checked out your first footer link! ROFLMAO! Elostirion74: hmm. You've got so many fabulous questions Squire! I wish I had been more learned in architecture, then I could've given more thought to my response. Weaver: Wow, this is a Scene Discussion Smorgasbord! So much to enjoy and so many questions to pick and choose from -- you set a nice table, Squire. Thanks for all this effort! squire: The opening shot is about 25 seconds long, easily the longest shot of the chapter. It starts with Gandalf lighting up his staff, and pans back behind him to reveal, one after the other, the entire company: Legolas, Gimli, Merry and Pippin, Frodo and Sam, Aragorn, and finally Boromir. A. The scene opens with a complete black-out, out of which Gandalf’s stone lights up. Where else does Jackson use blackouts? FarFromHome: Is this a black-out? I interpret it as "real" darkness - a sudden, catastrophic loss of light as the Fellowship are trapped in the "long dark of Moria". It strikes me as a fairly common movie convention - things suddenly fall in and the heroes are cast into pitch blackness, then the darkness is broken by, say, a match being struck. I like the way Jackson casually throws this kind of convention into his fantasy film - it stops it getting too precious. Mortae: Ironic how your answer and how this scene ties in elements of Darkstone's question concerning "National Treasure". A number of times Cage was left in the dark only to decifer clues that shed light on certain directions that group needed to continue. Here we have one darkness that all Gandalf must do is light his staff. Quickly he will find another darkness of a sort, as to the the direction to take. The light that tells him the correct direction is the one in his memory. The use of darkness does immerse the audience into the world we see on screen. This is much better than the fake dark that gives the audience night vision. squire: B. Why this particular order? Why is Legolas so prominently featured? And why does Boromir come last, behind Aragorn? FarFromHome: I think Boromir comes last because he was digitally added! (He says in the cast commentary that he was in the UK at the time.) But he also seems to be the most reluctant. I'd never thought about Legolas being so prominent. Perhaps as an Elf he's considered to be the one who would find Moria the most alien and curious. Elostirion74: Well, Gandalf is the guide and must go first. I suppose Legolas is prominently featured because here he's out of his environment, while still having a keener sight and a stronger awareness of things unseen to guide him than the others. Boromir is last because he's reluctant to go and Aragorn walks at the back as the guard of the company. I'd venture to say the hobbits are put in the middle in order to be more protected from attack, perhaps from straying out of the way, and from falling when climbing. squire: C. Where does Gandalf get the stone that lights up so helpfully? Did it come from Rivendell (since he lost his first staff at Isengard?) Is it the same as the Elf-glass that Frodo gets from Galadriel and which serves the same purpose in Shelob’s cave in the third movie? FarFromHome: Wizards aren't about to tell us where they source all their magical stuff, now, are they? ;-) Maybe it's from the same guys who provide the fireworks - a crystal sounds like the kind of thing they might come up with. Maybe he sent Gwaihir off to get both the staff and its crystal and bring them to Rivendell? I don't know about non-book-readers, but to me, the utilitarian light in this staff doesn't remind me of the star-glass (even in the movie, Galadriel's repeated mystical words about "a light to guide you in dark places" makes the star-glass seem more than a mere physical source of light). The light of the White Wizard's staff, in contrast, is more like the star-glass. And it does come from Lothlorien. No time for more right now. Thanks for the amazing web page - I'll go and read some more. Old_Took: On The Crystal. Gandalf built and designed those fireworks himself! I can imagine him tramping across the wilds of Middle-earth and happening upon some bit of crystal that he now keeps in his coat pocket...just in case! Aunt Dora Baggins: I wonder if his ring has something to do with him being able to light the crystal. I've always understood the ring was what gave him some of his skill with fire, so maybe it helps supply some kind of light to an otherwise inert crystal. squire: D. Does this long opening shot set the appropriate atmosphere for the coming sequence? Does every “chapter” in the film have a similar long establishing shot, telling the audience that a new adventure is beginning? Elostirion74: For me it does (the architecture along with the vast emptiness, the sense of wonder and at the same time of watchfulness) and I'd wish they had used a similar effect in the Dwarrowdelf, since the film naturally couldn't underline the SENSE of walking in the darkness to the same extent as the book. This black-out may be a convention, but it's an appropriate convention for their present situation. I also think it's taken directly from the book. Almost every part of the film has an establishing shot signalling that we're entering a new place and also put in to give you an impression of the general feel of the place. Weaver: Well -- I say that's pretty true. There's the big establishing shots of Mordor and the battle in the Prologue, the pull away shot of the Shire as Gandalf and Frodo ride over the bridge into Hobbiton (which made me feel like I was "entering a story" the first time I saw FOTR), the establishing shot of Frodo at the balcony in Rivendell, those panaromic views of Meduseld in TTT, and Gandalf's ride up to the top of Minas Tirith, to name a few others. Now that I think about, all of these views are some of my favorite images in the films. Tolkien was a master at making his settings real, with his attention to the rocks, plants, weather, building, history, etc. as we traveled with him through Middle Earth -- these film scenes show Jackson at his best in terms of capturing some of the "sense" of Middle Earth. The emphasis that the author and film makers spent on establishing the different scales and locales go a long way to making Middle Earth credible, at least for me. squire: The next thing we see, the company is climbing some stairs in the back of the chamber full of corpses. Gandalf: "Quietly now. It's a four-day journey to the other side. Let us hope ...."
E. Did you notice the architecture of this chamber, either in the previous scene (“Moria”) or in this brief shot? Did you notice that it echoes the look of the Bridge/Aqueduct from the landscape outside of Moria? Elostirion74: I noticed the architecture around the stairway we've just left vaguely, enough to see that it looks very much like the painting by Allan Lee from the centenary edition of LoTR if I'm not mistaken. I didn't see the resemblance between this chamber and the bridge, though, but I liked it, all right. 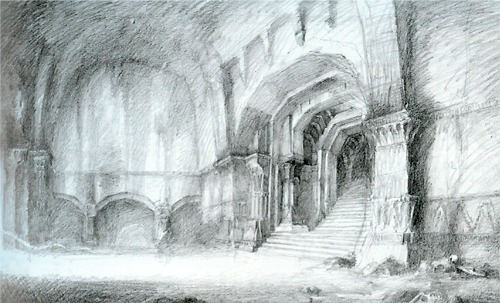 squire: Concept designer Alan Lee and production designer Grant Major both say in the articles linked here that they derived the look of the Dwarves’ architecture from the “chipped”, “geometric”, “angular”, and “crystalline” feeling of mined stone and the slashing gouge-forms of dwarf-lettering, the Runes. Runes used in The Lord of the Rings. F. Do you agree that this is the best way to represent Dwarven building-forms? Could you suggest any others? Does the remarkable resemblance to Art Deco, with its machined industrial esthetic, make you wonder if the dwarves had a more modern technology than the rest of the movie suggests? squire: Jackson opens his commentary with some interesting remarks on how the Fellowship has been forced by circumstances to go on a deadly journey that they had rejected just seconds before. But his conversation soon turns to chat as he, Boyens and Walsh all chime in with their opinions that the Moria section is the best part of the Fellowship book: “the best sequence in the book”; “I love Moria”; “one of the most well-written parts of the book”. G. Do you agree? Are there other “well-written” parts of Fellowship that you wish had gotten the kind of screentime and attention that Moria did? How much of this adaptation may have been driven by the writers’ emotional responses to the material, rather than an attempt to follow the author’s sense of dramatic proportion? Elostirion74: Not sure if your last question is about the Moria sequence or the book in general. I agree that Moria is perhaps the most evocative part of the book and one of the best written, although not THE best. In the house of Tom Bombadil, for instance, is on the whole even better IMO. But I've not analyzed it, really. What struck me on viewing the TE of FoTR was how they raced through the encounter with Strider (understandably) and the journey through the desolate landscape of Eriador in "A knife in the dark" (not so understandable) which Tolkien is able to bring so vividly to life. (Their stay in Lórien was what suffered most seriously from the cuts, though). When I see the EE, I always enjoy particularly the extra coverage from the latter chapter. I'm not surprised that the adaptation was driven to a great extent by the emotional response of the director and co, that must be after all their main inspiration. Moria is very important for the story, since this is where Gandalf is lost and it's easy to understand how Moria would appeal to the director and co. cinematically as a place of wonder, old history, action and adventure (not to forget the moral points). It sums up so much of the ingredients Jackson wants to add to the movie. Weaver: Well, since I have a similar emotional response to Moria, I loved every minute the movie spent in there. I think the Shire gets similar, loving treatment, followed by Minas Tirith and Rohan (Meduseld and Helm's Deep) -- they all get "A's" from me. Rivendell and Mordor probably fall in a "B" category for me; what we got was good and appropriate, but I missed the Great Hall where the tales are told, and while I loved what we got of Mordor I wanted to see lots more. "C" settings for me are Lothlorien and the Dead Marshes -- they work, but weren't as I pictured them and didn't have the same emotional impact for me as they did in the books. And then there are sets like Osgiliath that I didn't expect to see at all. A number of other places, like Ithilien, the Forbidden Pool, the inside of Isenguard, Fangorn, etc. were not places I had a strong visual sense of, and no emotional attachment to either. So, I think you are right that we do tend to focus on the parts of Tolkien -- settings, characters and themes -- that resonate most strongly with us, and our reactions to the films largely depend on how well they meet each of our "personal" expectations. The only caveat I'd add is that I do think Jackson and company have a good sense of what parts of Tolkien are best suited to film, and I would think their decision to focus on Moria as much as they did is based on a "professional" opinion as well as that of any emotional reaction. As much as I love Lothlorien in the book, spending time exploring its timeless quality, at that point in the FOTR film, would probably just not have worked on screen. Instead, they sort of turned Galadriel into Lorien, if that makes sense -- all of the experience of that land in the books is crystalized into her character on screen. From having studied a few of the other attempts to translate Tolkien to the screen, it seems that no one who attempted it felt that the book could be filmed "as written." So, I'm inclined to think that Tolkien's structure works for the books, but any adaptation of it to another medium means changing the dramatic emphasis at times in order to make it work. Old_Took: Some Comments Some great comments...I also feel the decision to dwell on Moria was a "professional" as well as an emotional one. Your graded list of places proves your point that we react to certain aspects of the films based on our own emotional response to the book material...I loved the Shire, Rivendell, Moria, the Dead Marshes, Fangorn and Minas Tirith because they really stuck out to me in the book and I felt they were aptly translated to the screen. Helm's Deep and Edoras I had less of a book connection with. While Lothlorien was a visually exciting place in the films, it was a bit off from what I took from the books...more tense and dangerous, though I suppose this was needed in the overall structure of the movie. I agree with you 100% that Mordor was good but we needed more of it...lots more! squire: I had a similar set of reactions - but part of what I was wondering was: did Peter Jackson's emotional responses to the book weight the movie more towards certain scenes than towards others? For instance, did he in some way not really care for Lorien as he read about it in the book, and so mailed it in? Perhaps another director would "like" Lorien more, and so find a way to write and film its ineffable qualities? Put it another way: what parts of the book get "excess" screen time because the director just plain loves that particular material? Aragorn_Elessar: I think that that is an inevitability of any writer and/or director making a version of LotR, at least to a certain degree. A filmmaker will always want to include his favourite parts of a story when adapting a book into a film, and may be less inclined to leave in the less-favoured aspects of the story. If I were making the film, I would include, for example, the Barrow-wight because it is one of my favourite parts of the book; and the film would probably be weighted more towards the emotional side of things particularly in RotK, perhaps missing out to other parts of the story. Mortae: You could also ask that of characters. Weaver: well... At one point, Jackson said these were "Tolkien's films." At another, he said they were "Peter Jackson's interpretation" of Tolkien. To that effect, the films probably are weighted more in the direction of how Jackson sees the world -- a non-religious (from what I know), casually dressed, film director from New Zealand and a devout Roman Catholic, properly attired professor from England probably do see the world -- and Tolkien's story -- differently. Still, they have both been compared to "hobbits", and both fell in love at young ages with mythic stories that stirred them deeply. Jackson seems to me at least to have a closer connection to some (though not all) aspects of the story, than say that of John Boorman who came up with a highly sexualized approach to it. I do think someone who loved Lothlorien would probably make the movie differently -- and it would be interesting to see, wouldn't it? But if your challenge was to make a blockbuster film, as Jackson's was, I'm not sure you could really do Lorien well, no matter how much you loved it, as it would just slow down the action too much. If you were making an "art" film, or even a mini-series, you might be able to afford the time it takes to develop a timeless land. I guess my main point was that their choices on what to emphasize were based on professional considerations about what would work on screen, for a "Hollywood" backed film. To me, that explains more about the choices they made, more than their personal opinions. Though I can see that in cases where they had to "go to the wall" on something they might fight harder for a scene they loved, which would impact the final product. The closest comparison we'll have for awhile is the Toronto stage show. It's been interesting reading the feedback on Main from those who saw it -- from what I can tell, that version makes some different choices about what to emphasize in the story. Old_Took: On the Action I don't really like thinking that Jackson and co made their decisions to make the film a successful "blockbuster". They were really trying to make the best possible adaptation as they saw fit. As Alex Funke said, Peter was making a "war film". It could be argued that the Lord of the Rings books really revolve around war, so the films had to proceed similarly. The action-oriented pace of the film, I like to think, was appropriately dictated by this, rather than a desire to appeal to a certain demographic. Weaver: multiple goals, and a team approach... I agree the intent was "the best possible adaptation" - that certainly comes across in the various quotes from everyone included in the FOTR features. But they also had to please the studio, so "blockbuster" factors would be one of the things that they had to include in "best possible", wouldn't it? In some of his writings about the film adaptation, Brian Rosebury writes that one of the reasons that the films could be made successfully at this time is that to do them justice there has to be an understanding of Tolkien that goes beyond the director's vision of it -- and that this was only possible now, after Tolkien had been around long enough to soak up a couple of generations of readers, and for enough of them to make their way into the movie-making business. LOTR is "too big" for one director to capture it all, and so it could only be done by a sort of "fellowship" that would each play their part to bring it to the screen. That's certainly the sense I get from the comments made by everyone from the directors/writers to the guy who made the chain mail by hand. The reason for this digression is that Jackson himself does seem attracted to the big battle scenes, though he has shown that he can also hit an intimate moment just as much, with things like the closeups on people's eyes, and hands, or the quiet moments between various characters throughout the films. What Jackson might miss in between seems admirably contributed by the rest of those who worked on the project. Well, I've wandered far from the original question here -- I guess my main point, if there was one, is that the emphasis on action was driven by several factors -- box office receipts, and a personal love of it by Jackson, and the great way Tolkien wrote these scenes in the first place. They all impacted what we got and why. Mortae: Where he succeeds, for me are the personal human reactions. He can capture or direct an actor to react in such a way that the reaction defines a grand or epic moment. The Fellowship seeing the Balrog. The tears shed outside Moria after losing Gandalf. The fellowship's reaction to Lothlorien. He "humanizes" (probably a bad word) the unbelievable and makes it easier for me to accept what is happening. Where he has his problems are in the smaller more intimate relationships or moments between man and woman. Not everyone will agree but the scenes between Aragorn and both Arwen and Eowyn seemed forced. Unnatural. More for "Special Moments" collection than a film. I know he wanted to capture the Fairy Tale/Fantasy love story in both feel and image but even that could feel less card board. Where there seemed more spark between Arwen and Aragorn is when they first meet and Arwen breaks the mold of the Fairy Damsel in distress. Just my impression of his strength and slight weakness. You could see the same problem in Kong. Aerin: It's worth noting that Moria was the first sequence of the film completed, so that it could be shown at Cannes - it served as a showpiece to give an idea of what to expect for the entire trilogy.